Worlds First PC Virus Brain turned 25 in this January. Researchers from F-Secure managed to get an interview with Brain’s creators Basit and Amjad Farooq Alvi from Lahore Pakistan. The short but interesting interview is available here. Welcome to the Dungeon © 1986 Brain & Amjads (pvt) Ltd VIRUS_SHOE RECORD V9.0 Dedicated to the dynamic memories of millions of viruses who are no longer with us today - Thanks GOODNESS!! BEWARE OF THE er..VIRUS : this program is catching program follows after these messages....$#@%[email protected]!! The reason for this message was the program was originally used to track a heart monitoring program for the IBM PC, and pirates were distributing bad copies of the disks. This tracking program was supposed to stop and track illegal copies of the disk. Another programmer copied the technique for DOS and it became the (c) Brain virus. 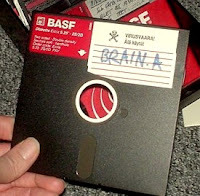 Unfortunately the program also sometimes used the last 5k on an apple floppy, making additional saves to the disk by other programs impossible. The company was sued for damages and was quickly dissolved. For more information about Brain and its writers please read the Techlahore article.